These four Melbourne Beach communities share a beautiful riverfront parcel just to the north of Driftwood Plaza (Publix). Windemere is an exclusive gated community of 8 single family homes. 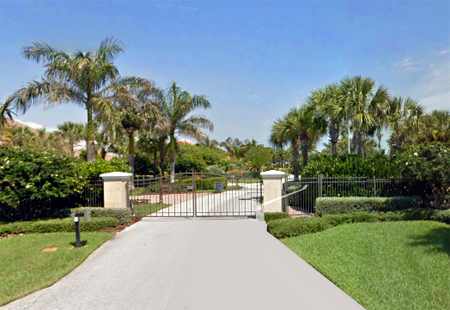 Gated Grande Bay features 4 luxury riverfront homes. Gated Waterford Bay condominium is a riverfront cluster of 6 two story homes (some attached), and features amenities that include river pier, tennis and a community pool. 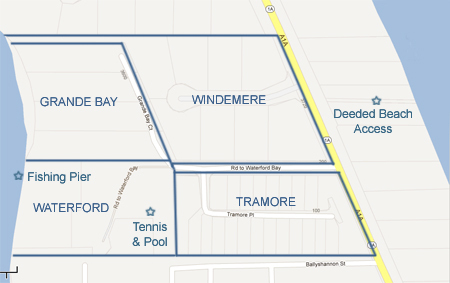 Tramore is more affordable, a desirable non-gated community of 20 duplexes at the front of the neighborhood. .3 miles north of Driftwood Plaza (Publix). 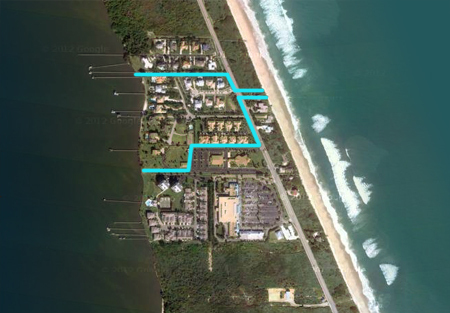 These Melbourne Beach communities are located in the in the upper south beaches. Enter via gated Windemere Court or the Road to Waterford Bay. Info: 4 separate communities with some shared amenities. Beaches: Shared beach access is available across from Windemere community entrance.